Inhomogeneous resorcinol-formaldehyde (RF) aerogels with continuously varying densities were prepared by a facile yet effective method. The preparation involved sol–gel technique and supercritical drying. 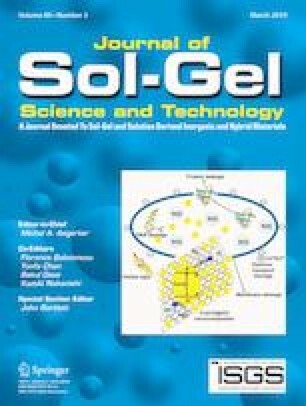 The low-density sol was pumped into the high-density sol continuously, meanwhile the mixed sol was blended and pumped into a cylindrical container continuously for directional gelation. Then the varying-density gel was washed in hot ethanol and dried by supercritical drying. The samples were investigated by scanning electron microscope and X-ray phase contrast imaging instrument. The problems of density mutation and non-monotonicity of density in samples were studied and well solved by controlling the blending and pumping of sols. Qualified samples with thickness of ~10–28 mm and density of ~0.19–0.62 g/cm3 were obtained. Further work is focusing on the samples’ performance in the experiments of trapping high-velocity particles and impact compression. Inhomogeneous resorcinol-formaldehyde (RF) aerogels with continuously varying densities were prepared by a facile yet effective method. The preparation involved sol–gel technique and supercritical drying. The problems of density mutation and non-monotonicity of density in samples were studied and well solved by controlling the blending and pumping of sols. The samples were investigated by scanning electron microscope and X-ray phase contrast imaging instrument. Qualified samples (~10–28 mm in thickness) with continuously varying density (~0.19–0.62 g/cm3) were obtained, and they were expected to be used in the experiments of trapping high-velocity particles and impact compression. 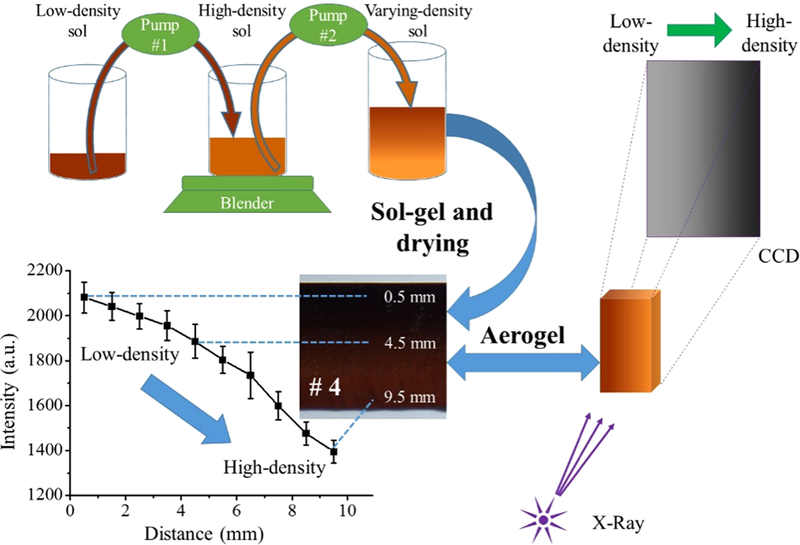 Inhomogeneous resorcinol-formaldehyde (RF) aerogels with continuously varying densities were prepared by sol–gel techniques conveniently. The concentrations of sols were controlled by mixing low-density sol and high-density sol via pumps and blender. The density mutation in samples was studied and avoided by controlling the concentrations of sols varying continuously. The effect of differential shrinkage and diffusion was studied and the trouble of non-monotonicity in density were solved effectively. This work was supported by the Natural Science Foundation of Shaanxi Province, China (2018JQ1026), Scientific Research Program Funded by Shaanxi Provincial Education Department (17JK0548), the National Natural Science Foundation of China (11874284, 51672224, 11404243 and 51102184), the Opening Project of Shanghai Key Laboratory of Special Artificial Microstructure Materials and Technology (ammt2018A-2), the Startup Fund of Xi’an University of Technology (109–451116016) and National-level College Students’ Innovative Entrepreneurial Training Plan Program (G201710700049 and G201810700048).